Three friends go camping to get high and have fun in the woods. Waking up with missing memories of the night before, that which is lost in the darkness haunts them. A love triangle grows from lost consciousness and paranoia isn’t the only thing that seems to be following them. There's a wretch created in their void of recollection as a monster closes in. 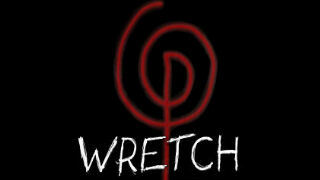 Possession, supernatural or paranoia, despair consumes in the Wretch. Director Brian Cunningham cuts from brief instances of handheld cam to classic feature, current time to flashbacks and reality to insanity successfully creating confusion is what’s real and what is of the mind. Lead actress Megan Massie is taken from fun loving, free love girl to drug induced, distraught mental patient who believes in monsters. She’s followed closely by her boyfriend Caleb (Spencer Korcz) and their friend and enabler Riker (Riker Hill). A good independent feature, all is not answered until the end which happens quickly. Those viewers whose hunger for answers isn’t satisfied, stick around for the post-credits for a taste of a little more.